The loop around Garnet Hill has ample sagebrush meadows, forested canyons, and long stretches along the Yellowstone River. It offers great opportunities to see some of Yellowstone’s mega-fauna. The trail starts at Tower Junction and parallels the stagecoach road to Yancey’s. The sagebrush meadows are frequently inhabited by bison and pronghorn antelope. At Yancey’s, the trail follows Elk Creek down into a forested canyon with great rock walls. It eventually opens up again as Elk Creek empties into the Yellowstone River. You come to a trail junction for a spur trail to the Hellroaring Creek Trail. At the junction, continue to the right and wrap around Garnet Hill to get a bird’s eye view of the Yellowstone River. You also look out across Buffalo Plateau to Hellroaring Mountain. 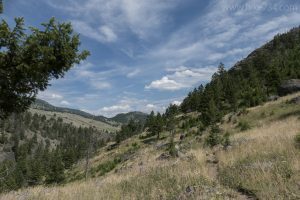 The trail then follows the Yellowstone River on a grassy, forested shelf. It then climbs through the trees up to the broad, sagebrush meadows. These meadows offer views, but can be hot and dry and provide little respite from the sun, so make sure you bring enough water. Follow the trail back to the road and walk the road 0.25mi/0.4km to your car. A nice side trip along the way is to take the spur trail to a swinging bridge over some vibrant rapids along the Yellowstone River on the Hellroaring Creek Trail. This will add 1mi/1.6km to the trip. Trailhead: Park in the parking lot just east of the gas station at Tower Junction and cross the road to the northwest to find the trail. The return trailhead is just north of Tower Junction on the Northeast Entrance Road.